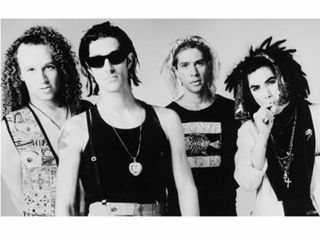 Jane's Addiction - back for good? The original lineup of Jane's Addiction rocked a tiny Los Angeles Mexican Bar called La Cita last Thursday night (23 October), and guitarist Dave Navarro calls the experience "old school 1987 Jane's." The reformed band - vocalist Perry Ferrell, bassist Eric Avery, drummer Stephen Perkins and Navarro - performed an hour-long set for a privileged crowd that included such notables as Tom Morello, fueling hopes for a full-scale reunion. Writing on his blog, Dave Navarro was over the moon about the gig, which featured some of the group's earliest songs, including Trip Away,1%, Pigs In Zen, Ted...Just Admit It, Ocean Size, Had A Dad and Been Caught Stealing. "Let me just say how sorry we are to everyone who came all the way down to the show and waited in line, only to be turned away at the last minute. Many of our own friends and family members were unable to attend as a result and it looks as though we are simply going to have to make it up to everybody somehow!" Which is another way of saying that all looks good for a for-real Jane's Addiction reunion in the very near future. On his blog, Navarro was especially effusive about original bassist Avery, who has been absent from Jane's events since the core group split in 1991. According to Navarro, Avery "brought the bottom punk rock glue that we have been missing for years." While the band has reformed at times with other bassists (including Flea), Navarro writes that "this machine cannot really run as well with after-market parts. Jane's Addiction has to be fully stock in order to do what it does best. "The quick non-stop pace left all of us and just about everybody drenched by the end of the hour. Everything came together, hopefully not for the last time." Curious to how it all went down? Check out this fan-shot video of Jane's Addiction performing Ocean Size.